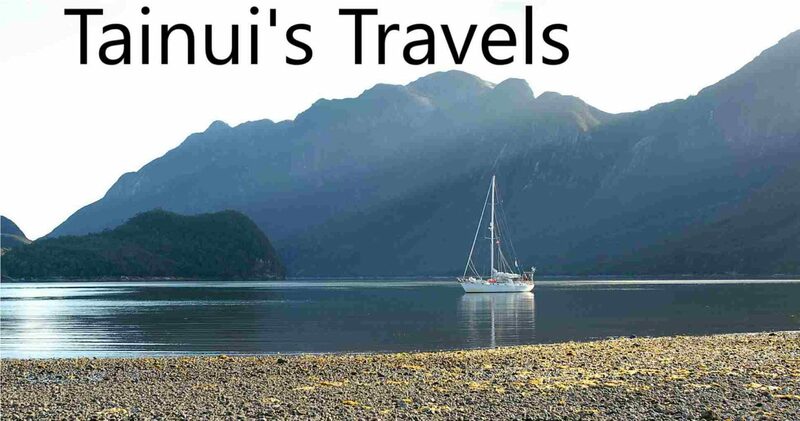 Tainui is a venerable 46 foot cruising cutter. 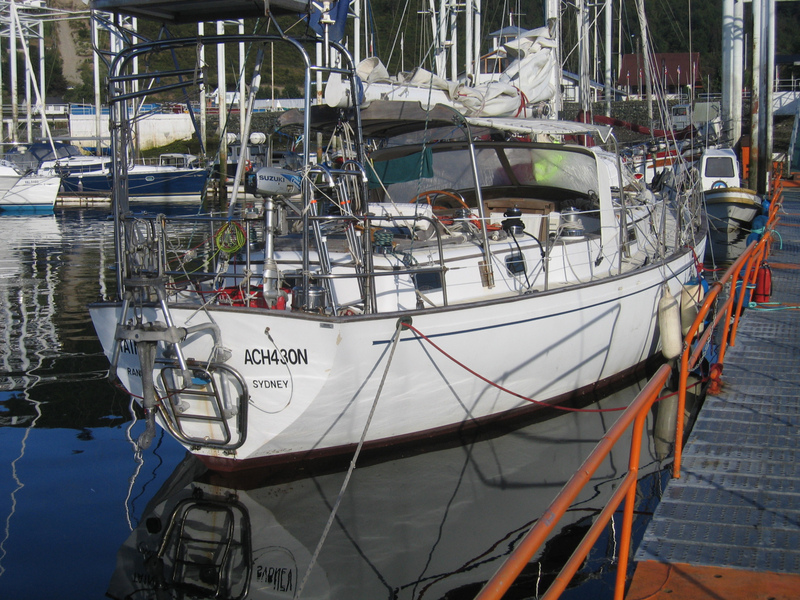 Nearly 40 years old, she is heavily laid up in fibreglass, with timber decks. A fine centre-cockpit ocean cruising boat, Tainui has never given me a moment’s worry, although I know that the reverse is not true. 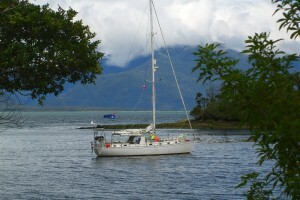 Tainui was built in Taiwan in 1976 to a modified Doug Peterson design. A number of these Formosa 46 yachts were built and, along with the original Peterson 46’s and Kelly Peterson 46’s, have explored all the world’s oceans and coastal waterways. By modern standards she is a small yacht, without the excessive freeboard, broad beam and cavernous interior spaces typical of modern designs. With long fin keel, cut away forefoot and skeg hung rudder her hull shape is best described as moderate in all respects. She is a well-mannered, comfortable and dry boat. The cockpit has only rarely been filled with water. She has a heavy mast and rig. Our standard cruising sails are Profurl furling yankee, hanked staysails, two loose-footed fully battened mains, with storm trysail on a separate mast track. Her 40 year old 80hp Ford Bowman diesel is noisy but reliable and does not complain too much. Because we have so much cruising gear on board there is limited space below although the solid teak interior layout is comfortable and very functional. We do not have a hot shower, microwave, washing machine or TV. But the galley is well laid out, the music system excellent and the cabin heating system adequate (but in high latitudes, only just). All navigation systems, radar, etc are to a high standard, although I have avoided interfaced electronic systems. Tainui is sailed easily by two and I have done many single-handed trips without any problem other than loneliness. 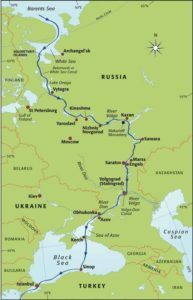 On passage her daily runs can comfortably exceed 200 nautical miles. 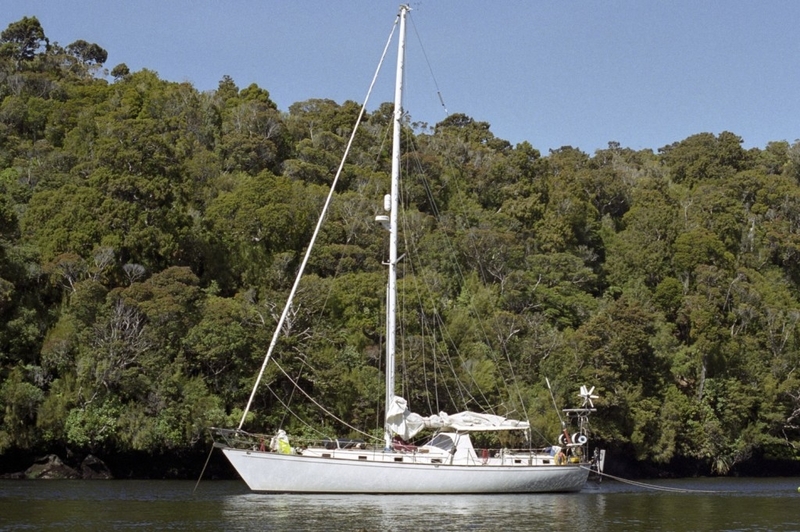 These days however, both Tainui and her owner have slowed down a bit – advancing age, laziness and an excess of prudence have me shortening sail earlier than I used to. I don’t steer much – we have a good Aries servo wind vane and a robust but very amp-hungry autopilot. Tainui tracks well under Aries, even under bare poles. Close fetching she has steered herself for days at a time without any assistance from me, the Aries or the autopilot.